This week I have started my spring cleaning. I always like to start about six weeks out from Easter so everything in my home is cleaned and ready for my big Easter family gathering and egg hunt. Plus, getting ready for spring is always so motivating to me with the spring bulbs popping up everywhere and more sunny days. 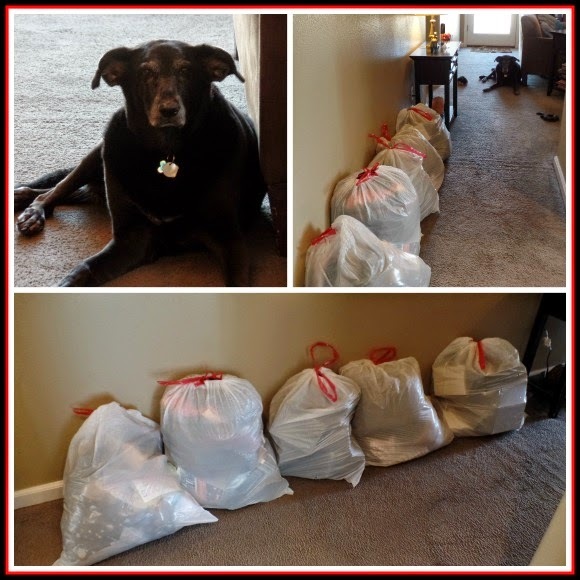 My declutter project last year really helped out and made the house easier to keep clean. However at the end of last spring I had gallbladder removal surgery and was out of commission for nearly a month, then unable to really get back to full strength for the gardening season, so sadly my garden is really in a state and needs a lot of work this spring. Which is definitely a high priority since I love working out in my garden. This year I hope to have a good full year of gardening! Last year I also meant to tackle the garage but only got part way through, since the garage is a main part of our storage system (we don't have much in the way of closet storage in our house) when it is disorganized it tends to have a ripple effect on the whole house. So even with all the decluttering that went on last year I really need to get things back in order. So I'm really motivated to tackle the garage this year. Also this past year, perhaps because of a weird side effect of the stress of surgery plus having my youngest graduate and entering into a new phase of life, I spent too much of last year doing "retail therapy" which has definitely added clutter! So I am really motivated to tackle my spring cleaning goals. 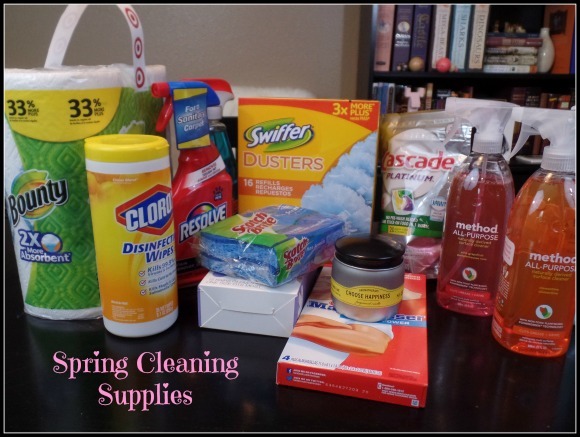 I stocked up on fresh cleaning supplies and made a room by room plan, and have already begun some of my spring cleaning projects. Here is a video I made for my YouTube channel discussing some of my favorite cleaning products, I also shared a detailed list of all of my spring cleaning projects and goals. 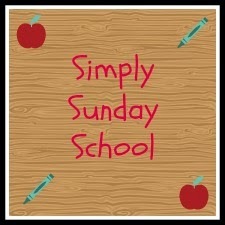 Today I am looking forward to cooking a big pot of chicken stew, then baking some Valentine treats for church tomorrow. I am looking forward to a nice Valentine's Day tomorrow. Also I am looking forward to taking part in The Great Backyard Bird Count this weekend. Last year I took part in the count for the first time and really loved it. Here is my post from last year about the Bird Count. Click the image below to learn more about this year's bird count. So that it what I am up to around here, I hope everyone has a nice Valentine's Day. It has been nearly a month since I have last updated my blog. January flew by faster than I could believe. I will try to update my blog more frequently, but since I have found myself busy with many different projects, I may not be able to update as frequently as I have written in the past. I still have many posts I would love to share, and hopefully will get back to more frequent posts in the future. 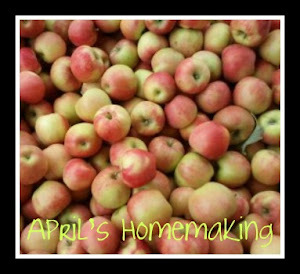 I have been fairly active on my YouTube channel- April's Home doing product reviews, and sharing some of the different things I purchase as well as meal plans and seasonal home tours, so you can catch me over there a couple times a week as well. I have been having a really fun time learning how to edit video. I am excited that spring is just around the corner, Punxsutawney Phil predicted an early spring, as did our zoo's local hedgehog. However there is also a tradition that if the day is 'fair and bright, winter will take another flight", and around here is was a pretty sunny day, so we'll see if we have that early spring that was predicted. While the rest of the US has had blizzards and storms, we have had an extremely mild winter, I have even had the windows and doors open to cool down the house on multiple days! I wouldn't mind a nice small little snowy day at least once this year, but over all, I love the start to the gardening season and am looking forward to getting back out in the garden. Around the house I have been getting ready for Valentine's Day, I love decorating for all of the little holidays this time of year. 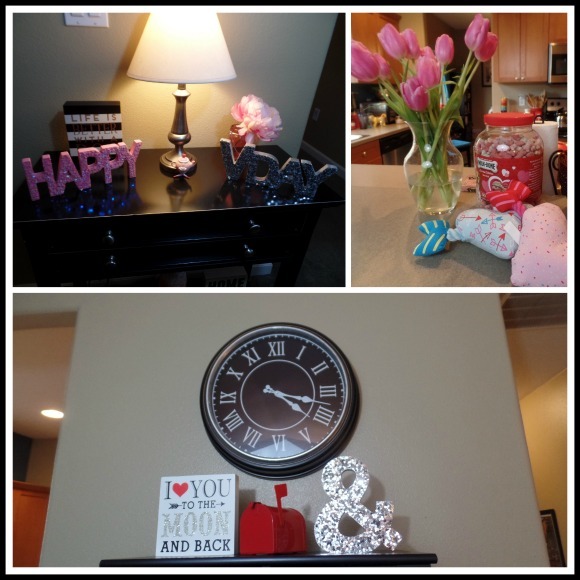 The main area of our home that I have decorated is the dining room. 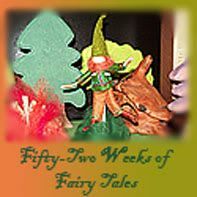 I have found many fun little pink red and gold decorations to set around the bookshelves. 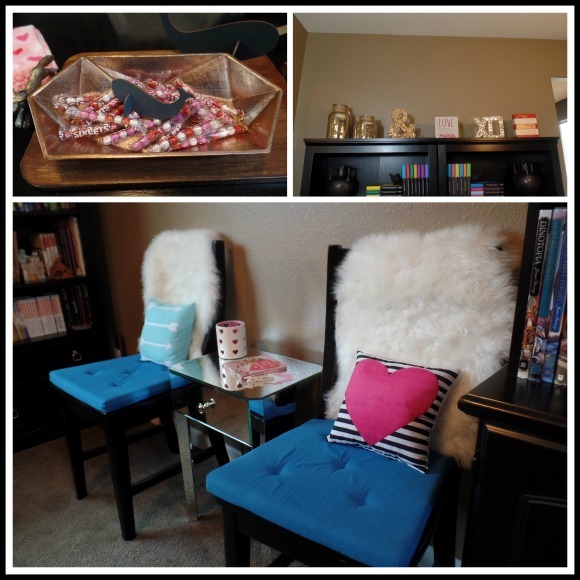 I made a cute new little seating area in the dining room with a little mirrored glass table I found on clearance after Christmas, along with some seasonal pillows on the chairs. It is a nice spot to sit and look through a book. 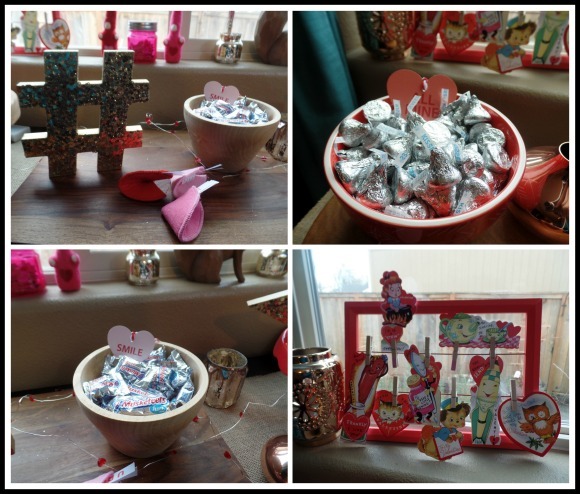 My side table is full of fun Valentine touches, with both some old favorite decorations as well as some new ones. I have also put out on display some vintage reproduction Valentines that remind me of the ones I would cut out as a child. 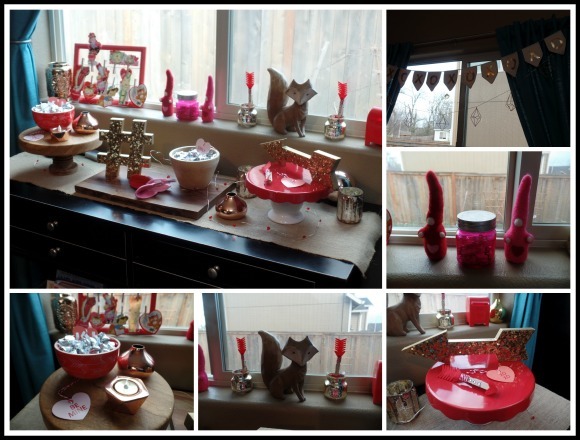 I found many of my new Valentine decorations at Target's dollar spot, they had so many cute decorations this year for very affordable prices, it was fun to pick them all out. 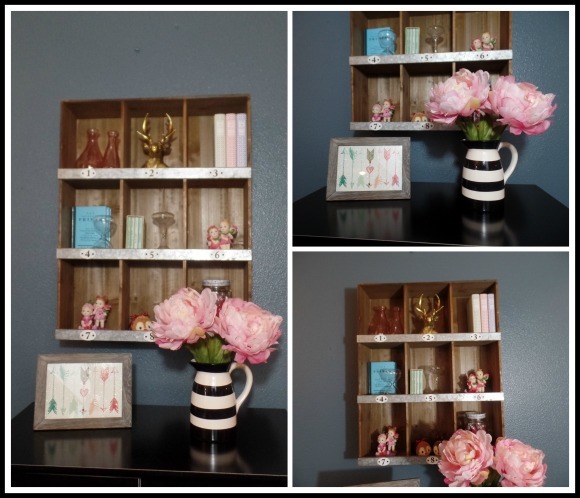 In the living room I have also replaced my large train print with this really interesting wooden cubby with metal and number details, it looks like an old post sorting shelf or something, I have enjoyed bringing in some wooden elements to my living room for a change. 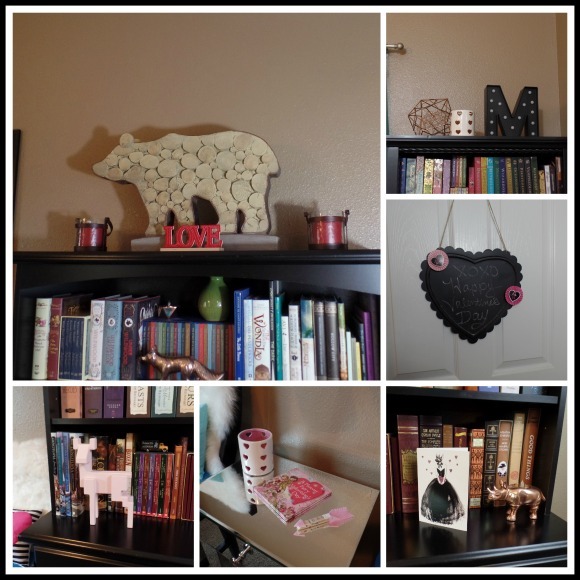 The other wooden decor item I have brought into the living room is this giant letter M (our initial) that I found after Christmas as well, I fell in love with it, and knew it would be perfect for the large space above my fireplace. 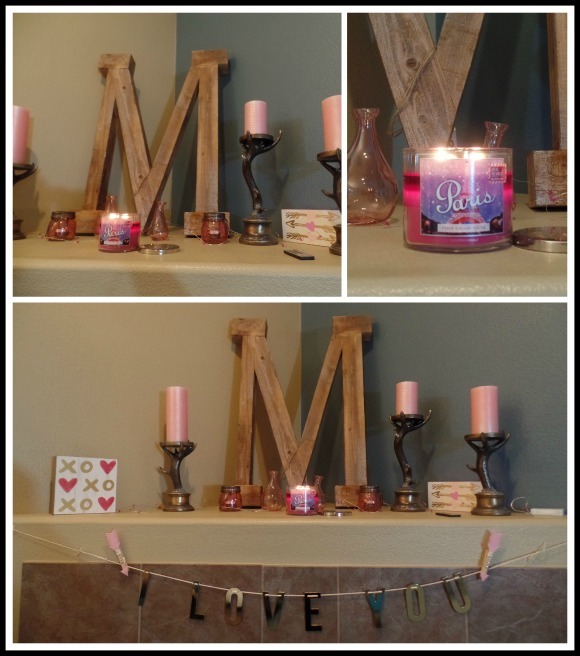 I've also included some pretty pink candles and lights to the mantel, which will also work for my Easter decor. 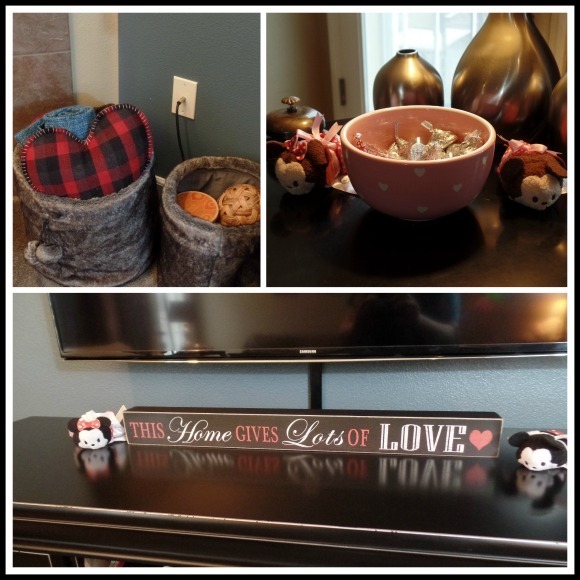 Here are some of the other little things in the living room, candy dishes and little wooden signs and things, as well as the fun plaid heart pillow, another after Christmas clearance item that I thought would work well for Valentine's decor. 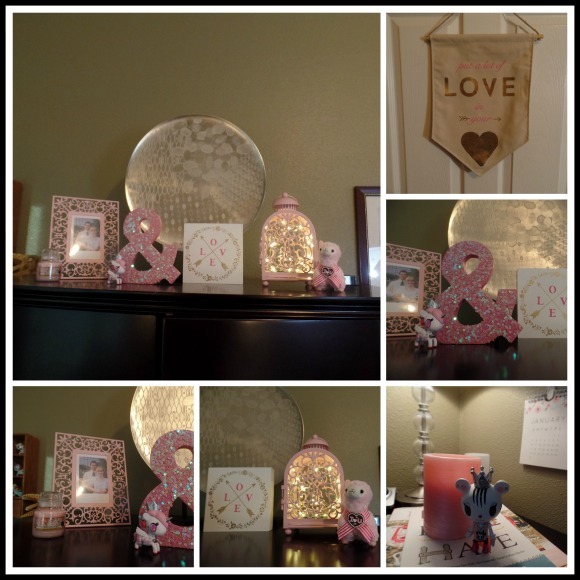 This past Christmas was the first time I really decorated our Master bedroom for Christmas as much as I did, so I decided to decorate our room for Valentine's Day as well, and found some fun pink decorations to make a nice display. In addition to all of the Valentine decorating I have been doing, I have been sticking to writing out and planning my dinner meal plan in two week sections. 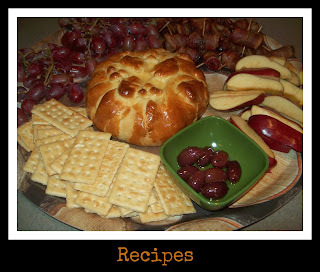 I have found that I am able to budget my grocery expenses a lot more efficiently, as well as serving healthier dinners. 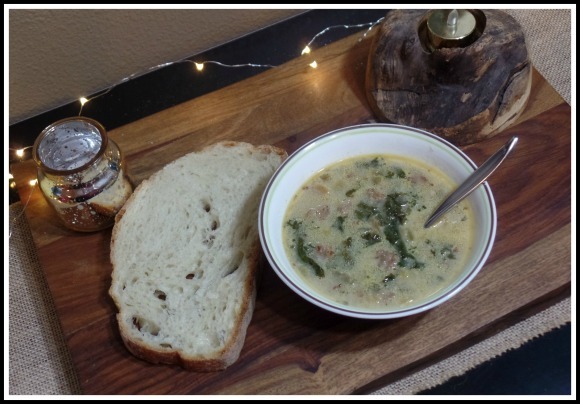 Last month one of my favorite meals was this Potato, Sausage, and Kale soup which we enjoyed with rustic French bread. In a large soup pot saute a bunch of chopped celery and one chopped onion in a couple tablespoons of olive oil until softened and slightly translucent. Then add a 48 oz box of Chicken broth and bring to a simmer. While the broth is simmering clean and chop about 12 nice boiling potatoes a good red or gold variety, I leave on about half the potato peel for color and texture, you can leave on as much of the peel as desired. Add the chopped potato to the soup pot and continue to simmer. I also add at this point a tablespoon of Italian seasoning and a little salt and pepper to taste, as well as a few cups of water to make sure the potatoes are covered and that there will be plenty of broth. In a separate skillet brown a pound of regular ground sausage like Jimmy Deans. When the sausage is cooked through and browned drain thoroughly and add to the soup pot. Simmer on medium low heat until the potatoes are cooked though. About 30 minutes before the soup is done clean a bunch of Kale, I like the curly variety, remove any of the tough stems. I like to pull off the leave and rip into smallish pieces, then add to the soup. Then add about a half cup of cream, perhaps a little bit more if needed until the soup looks slightly creamy. 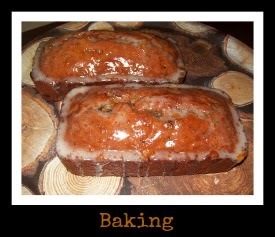 Check seasoning, add a bit more salt or pepper if needed. Serve when the kale is softened and cooked to your liking and the potatoes, onion and celery are all cooked through. 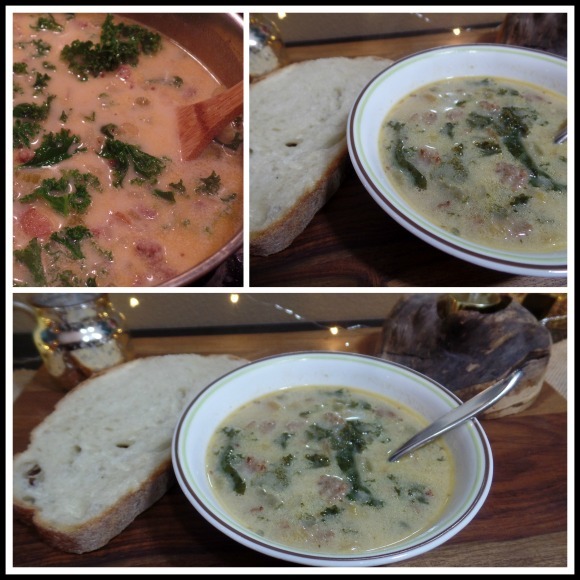 I like to serve this soup with a crusty rustic french bread topped with a little butter. I hope everyone is doing well, thanks for stopping by!